Under the right conditions, the amount of algae in a lake can increase dramatically, causing a bloom. Not only can this can be unsightly, it can be dangerous. Some algal species produce toxins that can be harmful to humans and wildlife. Since 2015, many LMVP volunteers have been monitoring our lakes so we may measure the most common toxin, microcystin. In 2017 we began measuring an additional algal toxin. Cylindrospermopsin, like microcystin, is a hepatotoxin, meaning it affects the liver. The EPA recommends cylindrospermopsin levels in finished drinking water be below 0.7 µg/L to protect bottle-fed infants and pre-school children. 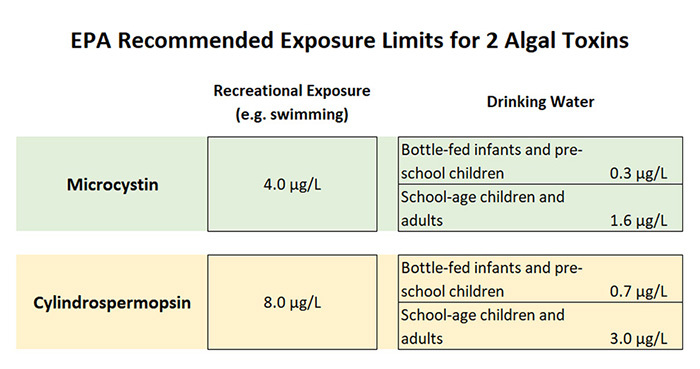 EPA’s recommended recreational exposure criteria (e.g. swimming) is 8 µg/L. Image from Loftin et al., 2016. 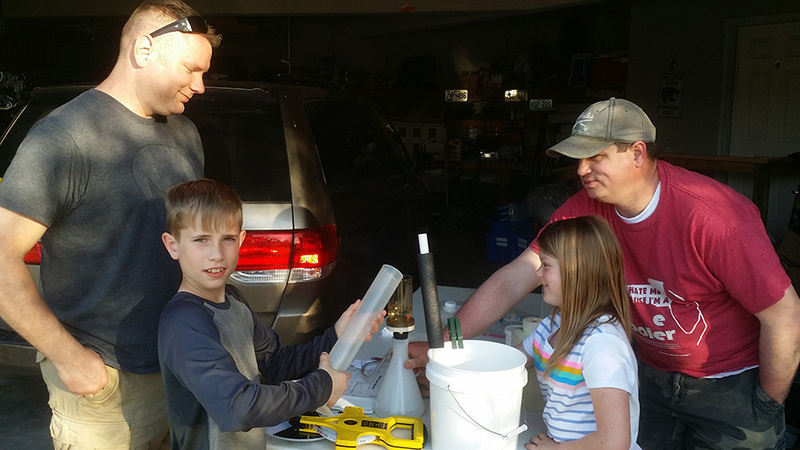 During the 2017 sampling season, concentrations of both toxins were low throughout the state. Only 3 lake sites monitored in 2017 exceeded EPA draft recreational exposure criteria for microcystin. No monitored sites had cylindrospermopsin levels of concern. 2018 is looking good so far, but if you suspect an algae bloom is occurring, do not swim and keep your pets out of the water. You can report a suspicious bloom to the Department of Natural Resources by visiting: dnr.mo.gov/env/cyanobacteria.htm. 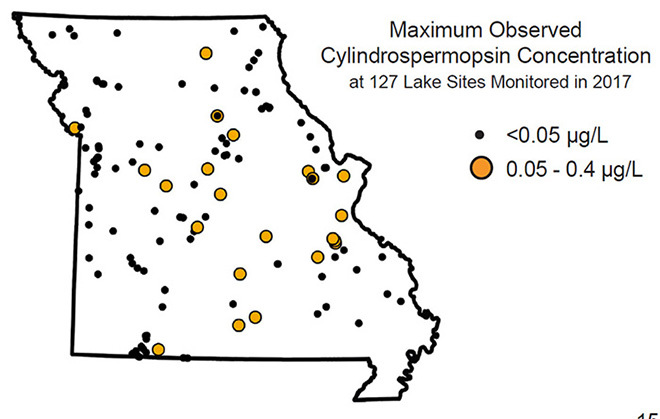 Each dot shows the maximum observed cylindrospermopsin concentration at 127 lake sites monitored in 2017. No values greater than 0.4 µg/L were measured. See table below for EPA recommended health advisory values. Data shown are the result of 2 University of Missouri projects, the Lakes of Missouri Volunteer Program and the Statewide Lake Assessment Program. 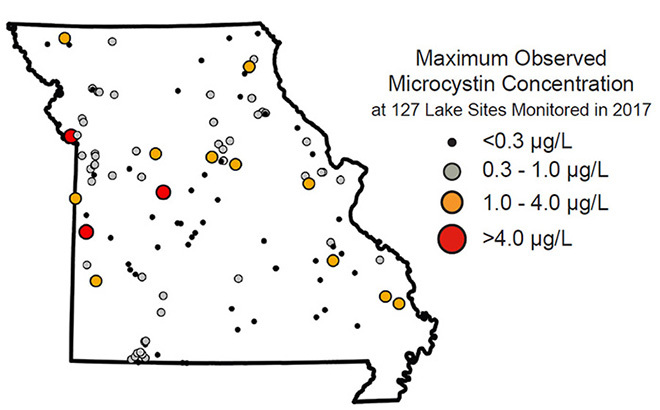 Each dot shows the maximum microcystin value observed at 127 lake sites in Missouri during 2017. A small black dot means that all samples from that particular lake had very low or undetectable concentrations of microcystin. 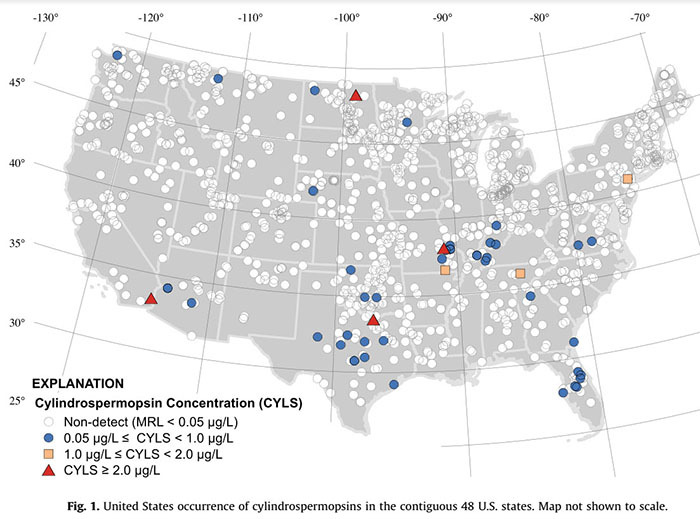 Large red circles mean that at least one observation had a concentration greater than 4 µg/L. 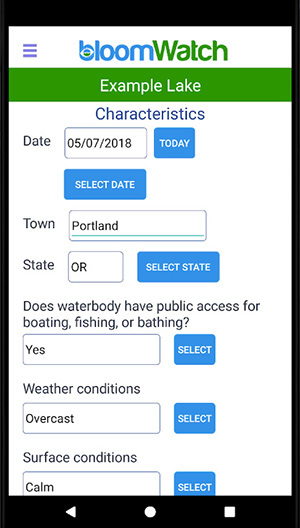 A great way to document cyanobacteria (aka bluegreen algae) blooms is with your smartphone. Bloomwatch is an app for reporting and documenting blooms. The app lets you upload photos and “pin” the location with coordinates.